This report covers conditions and observations made between Monday, April 28 and Sunday, May 25, 2014. The next report is scheduled for Monday, June 30, 2014. However, in the event of any significant occurrences prior to that date, this site will be updated as soon as possible. Daily maximum temperatures during the period exhibited a cyclic pattern, rising above and falling below seasonal normal levels in weekly succession. Several low-pressure systems spiraled over the state during the period, casting scattered showers over the region. Official rainfall totals in areas receiving precipitation ranged from trace amounts to nearly one inch. In the North, crop development continues at a strong and slightly accelerated pace. Observers are reporting that kernels of all varieties have now become fully solidified, or nearly so, leading many believe that the crop maturity is running approximately one week ahead of last year. However, this will not be confirmed until the first hulls of the Nonpareil begin to split. This is expected to occur along the west side of the region at the end of June or first days of July. Central Area– as in the north, observers are reporting that kernel development is progressing normally and slightly ahead of last year. Additionally, solid kernels of several pollenizer varieties were also observed. Southern Area – At the end of the period, kernels of all varieties are now fully solidified, or nearly so throughout the region. The solidified kernels are able to tolerate a bit more water stress, allowing growers with limited supplies to reduce their irrigation volumes slightly. All in the region will be monitoring their orchards closely for the next major phase of crop development, the hull split of the Nonpareil, which could begin at the end of June. Water is on the minds of all in the region. Warming temperatures and windy conditions have moved growers into a summer-time mindset as they monitor moisture usage and schedule irrigations to meet the tree’s requirements. Those sourcing water from privately owned wells are hoping that they will be able to make it through the growing season. 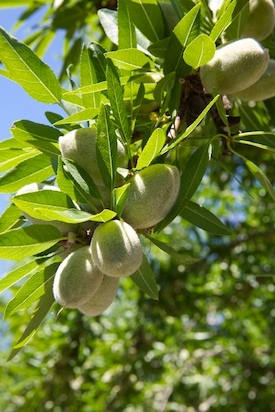 Growers throughout the almond-producing region spent the month focused on water management as they worked out the season’s supply of water. In the North – In addition to providing water, growers have also been quite busy managing fertilizer requirements and monitoring pest populations within the orchards. Observers are reporting that the orchards are in generally good condition with few disease issues. Central Area– Casual observation of the region’s orchards indicates that the orchards are in good to very good condition. However, closer examination from within the orchards reveals increasing water stress, particularly along the west side of the region. Lack of spur growth is the most typical sign of water stress. While not necessarily playing a role in the current crop, this new growth is required to sustain subsequent crops and is an indicator of potential impacts on the developing nuts now in the trees. Some west side orchards are also showing increasing levels of salt injury resulting from the use of poor quality ground water from privately owned wells. While nearly all orchards in the region are receiving some amount degree of irrigation, there are a few plantings that have been abandoned due to a total lack of water. Southern Area – Windy days and periods of above normal temperatures have exacerbated the situation, driving water consumption by the trees. Measurements of the daily evapo-transpiration rate published by the California Irrigation Management Information System, CIMIS, show typical pan evapo-transpiration, ETp, rates at 0.25 to 0.30 inch per day during the period. However, windy conditions have also driven ETp rates above 0.35 to as high as 0.40 inch. For growers facing limited water supplies, University of California researchers are recommending that the amount of water be spread evenly throughout the growing season, while trying to maintain enough for a post-harvest irrigation to support the flower buds needed for the next crop. Observers are reporting that growers in the Madera County area are facing dropping water levels in their private wells. Well drillers and service companies have been kept very busy trying to keep up with the demand for their services. The U.S. Bureau of Reclamation, which manages the Federal Central Valley Project has announced that it will use water stored behind the Friant Dam near Fresno to supply water to the group of west side irrigation districts, collectively known as the Exchange Contractors. This action leaves lands along the east side of the region without a major supply of water for the season. While water worries have dominated discussion among the region’s growers, the normal growing season activities cannot be ignored. Weed control and fertilization of the developing crop played a major role in the grower’s daily schedule of activities during the period and quite a few spray rigs could also be observed crawling through the region’s orchards as growers timed treatments to the susceptible stages of Navel Orange Worm and Peach Twig Borer. Growers have been applying Gypsum to the orchards in an effort to enhance water penetration and leach salts from the root zones. Weed and insect management operations have also played a large role in grower schedules as they work to support the crop.